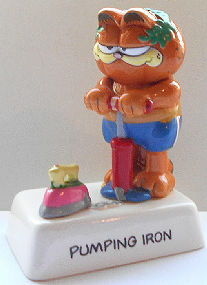 Here is Garfield with a bicycle pump adding air to an iron. Not exactly the iron we thought he would be pumping. This ceramic figure is 3 3/4" wide x 5 1/4" high x 2 1/2" deep. 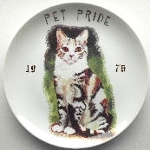 Design copyright Garfield 1978 and 1981. Previously owned but in good condition.